Whether you opt for fresh-cut or fresh out of the box, trimming the tree is a staple of holiday decor in most homes. However, if you’ll be entertaining this season, you may want to go beyond the tree and take your seasonal decorating to whole new level. Cook up some fun: Whipping up dinner for a house full of guests won’t feel like such a chore if you rely on cookware that makes meal preparation fun. For example, Martha Stewart’s Holiday Enamel Cast Iron collection can bring on the holiday cheer. With its festive plaid pattern and bright colors, the collection makes holiday entertaining special. Oven safe up to 500 F, these pieces can also be used with nearly any cooktop. Choose from gray or red plaid designs and 2-quart or 6-quart pot and lid combos. Set a stunning stage: Go ahead and fill your guests with delight before they even sample their first bite. A holiday spread served over festive placemats and cheerful motifs can make your table come to life. Bring vibrant colors and cheeky detailed design to your dinner table with an option like the Cellar Holiday Dinnerware Collection. Placemats and coasters feature seasonal images like snowflakes, ornaments and red and green lettering with a cheerful “Ho Ho Ho.” Salad plates and mugs showcase whimsical animal art with beloved creatures like dogs and giraffes. 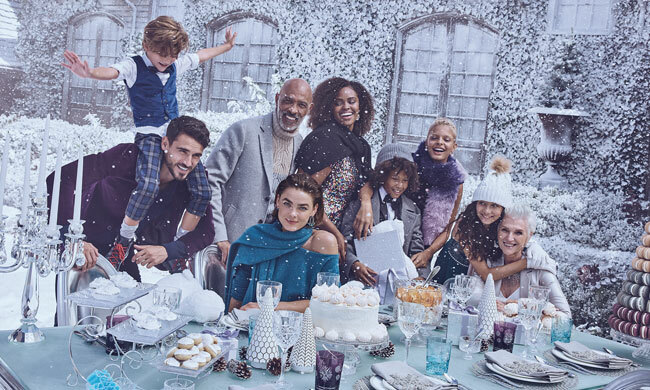 Find these holiday entertaining products and more at macys.com.